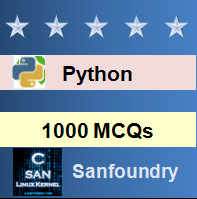 This set of Python Multiple Choice Questions & Answers (MCQs) focuses on “Regular Expressions”. 1. Which module in Python supports regular expressions? Explanation: re is a part of the standard library and can be imported using: import re. 2. Which of the following creates a pattern object? Explanation: It converts a given string into a pattern object. 3. What does the function re.match do? Explanation: It will look for the pattern at the beginning and return None if it isn’t found. 4. What does the function re.search do? Explanation: It will look for the pattern at any position in the string. 5. What is the output of the following? Explanation: This function returns all the subgroups that have been matched. 6. What is the output of the following? Explanation: This function returns the entire match. 7. What is the output of the following? Explanation: This function returns the particular subgroup. 8. What is the output of the following? Explanation: This function returns a dictionary that contains all the matches. 10. What is the output of the following?